Man, I have missed French onion soup. 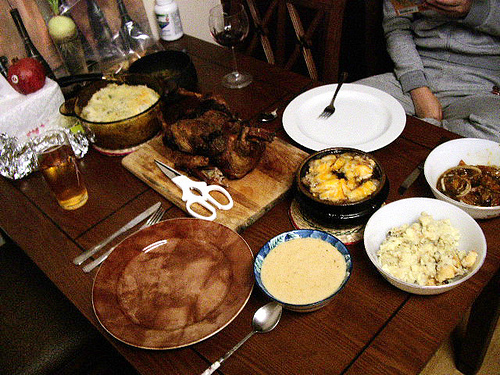 Major comfort food. This was part of my Christmas menu this year. What had stopped me from making it earlier was my boneheaded francophiliac puritanism. I felt that you needed brown beef stock and sherry to make it properly. 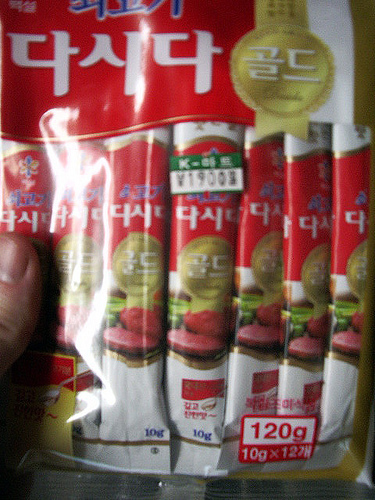 You’re not going to find brown beef stock in Korea easily for two reasons. Beef bones are very expensive, as they are used to make the extremely popular SeollongTang and GalbiTang, soups that require white beef stock. Demand far outstrips supply in this department (Hmm… business idea… nope–Korean government wants no beef with bones imported from America). Even when people shell out the money on expensive beef bones, they likely don’t have ovens to brown the bones in. Besides chicken stock, which does work, you can get packages of powdered white beef bullion, or Sogogi Dashida (ì†Œê³ ê¸° ë‹¤ì‹œë‹¤). It works just as well. 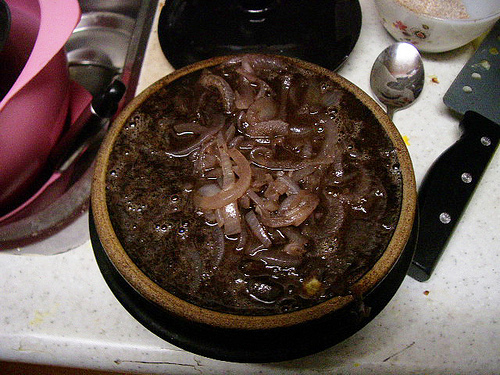 Anyway, the browning of the onions gives the soup its color anyway. 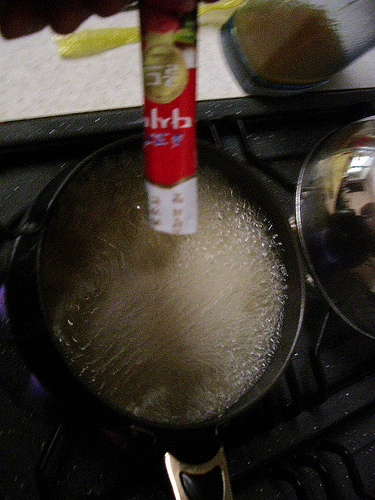 I boiled a small sauce pan of water and add three little packs of Sogogi Dashida. Turned off the heat. 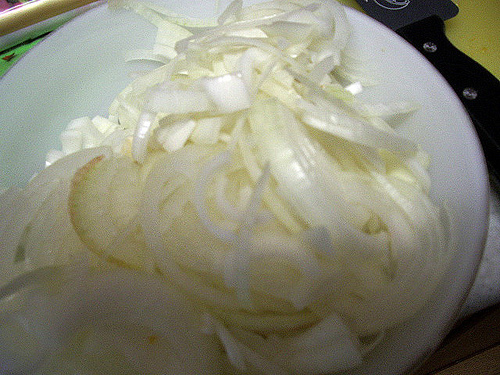 I sliced up a buttload of onions. It’s hard to overdo this one, as they reduce a lot. 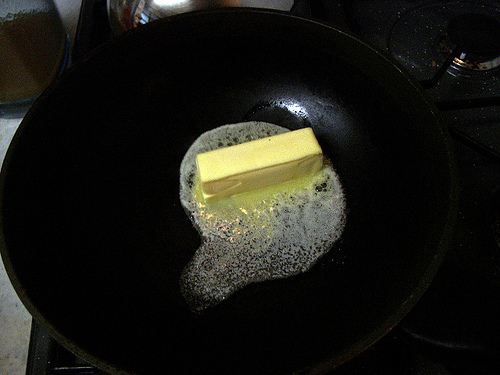 Then comes the butter. A whole stick? Hell, yeah. 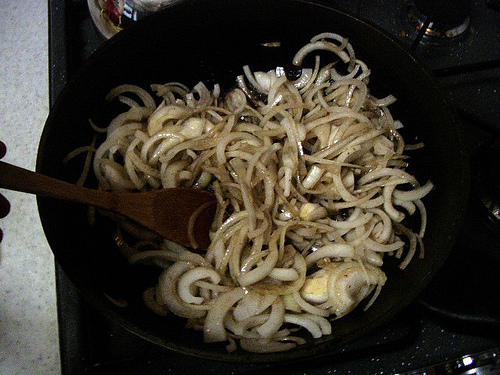 Slowly melted it and slowly cooked the onions. Slowly. Gently. 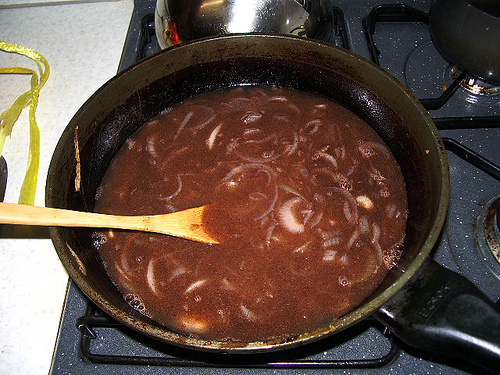 When they were soft and a little brownish, I added the beef stock I had made in the sauce pan. Now for the fortification. No sherry, but what is sherry anyway? It’s a fortified wine. What’s a fortified wine? Really, it’s a regular wine with sweet crap thrown in it. 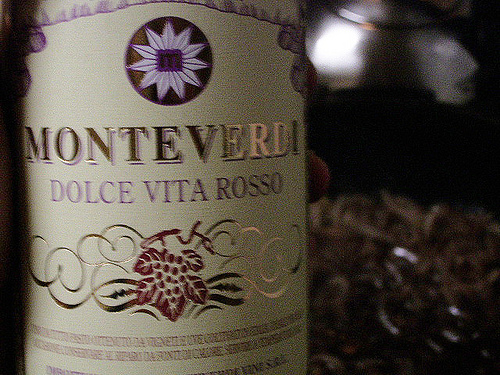 So why not use a cheap sweet Italian wine–the kind Eun Jeong likes so much? Hey, it worked. Threw around half a cup in there. Maybe more. Definitely not less. 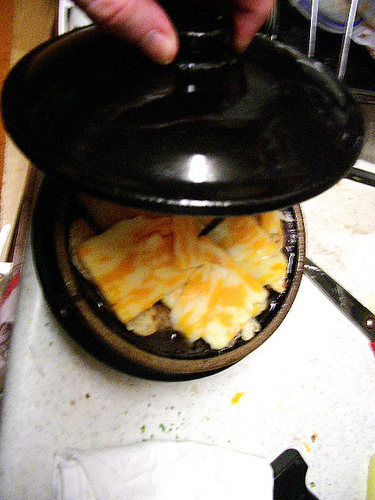 I let it cook a bit and cut up some cheese. I also made some croutons by toasting some bread I had made. A Korean soup crock made the perfect vessel for this. 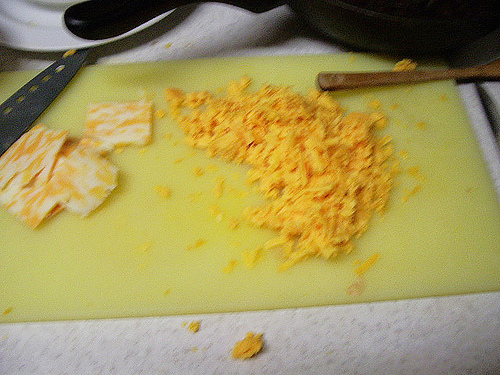 I set the croutons on the soup and covered it with cheese (an optional step). I covered it to let the cheese melt. Nice addition to Christmas dinner.